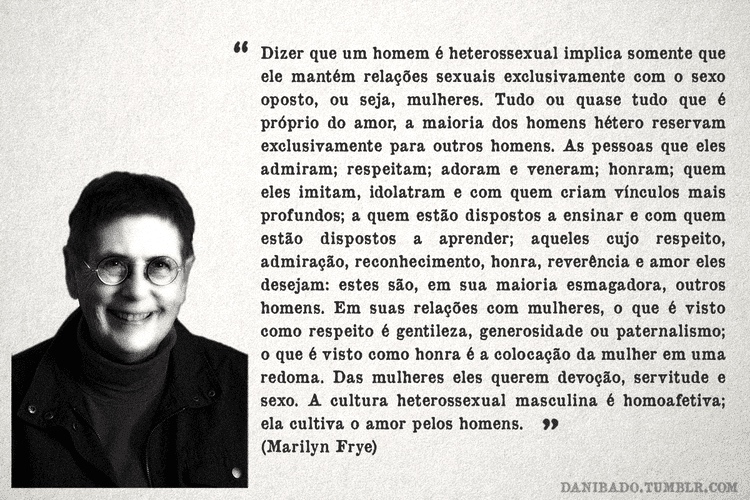 Marilyn Frye (born 1941 in Tulsa, Oklahoma) is an American philosopher and radical feminist theorist. She is known for her theories on sexism, racism, oppression, and sexuality. Her writings offer discussions of feminist topics, such as: white supremacy, male privilege, and gay and lesbian marginalization. Although she approaches the issues from the perspective of justice, she is also deeply engaged with the metaphysics, epistemology, and moral psychology of social categories. This entry was posted on August 1, 2018 at 8:16 am and is filed under Art, Gender and sexuality, Homosexuality, Masculinity, Philosophy. You can follow any responses to this entry through the RSS 2.0 feed. You can leave a response, or trackback from your own site.